Replacing the Windows print server cluster: Windows print server clustering has been until now the best practice for high availability printing. However, since Windows Server 2012, Microsoft no longer supports clusters for printing. Also, a Windows Server 2016 print cluster doesn’t exist. Microsoft is trying to replace print clusters by virtualizing print servers, and thereby attempting to implement a consistent approach to high availability. Unfortunately, however this is not enough. That’s why ThinPrint provides a comprehensive print cluster replacement. Virtualization alone doesn’t ensure high availability printing: It is often assumed that virtualization solutions such as Microsoft Hyper V or VMware vSphere (formerly VMware ESX) ensure high availability for printing. Unfortunately, this is wrong. Virtualization solutions check the availability of servers and run a new virtual machine when a server fails. This helps with problems that are caused by hardware errors. However, hardware failures are rarely the cause of print server failures. Much more common are print-specific problems such as incompatible printer drivers which cause a print server to fail. With virtualization, such errors are duplicated to the new server. The result is that printing problems persist. Downtime also occurs when a new virtual machine is started, as well as during updates and server reboots. ThinPrint combines server clustering with dynamic resource distribution to ensure high availability printing. This makes the printing solution not only an alternative to print clusters, but it also performs so much more, since faults can be detected earlier and maintenance can be carried out thanks to the convenient maintenance mode. Failover print servers: Two or more Windows print servers can be grouped together. ThinPrint constantly checks the availability of the servers and thanks to an early-warning system, responds promptly to print-specific problems or instabilities, for example when mapping printers. In the event of a fault, another running server is automatically switched to (failover) and all printer mappings are automatically redirected to it. This results in significantly less downtime than any other solution can offer. Load balancing: Users’ print jobs are evenly distributed among a group’s print servers. 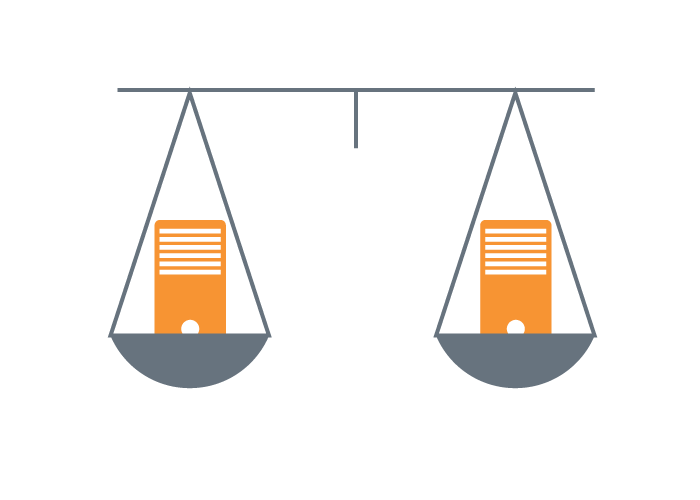 Server load balancing ensures high performance printing and optimal use of the available resources. In addition, there is no need for manual administration tasks when assigning printers and users to specific print servers. Server maintenance at any time: With just a single mouse click, administrators can place the print servers in maintenance mode during running operations. New print jobs are immediately forwarded to other servers in the group, and only the existing print jobs on the initial server are processed. As a result, IT staff can perform maintenance during normal working hours without causing downtime and impacting printing. Failover and load balancing for branch offices: A small hardware box – the ThinPrint Hub replaces local print servers in individual branch offices. Two or more ThinPrint Hubs can also be grouped together for failover and load balancing, ensuring uninterrupted workflows and printing across all branch offices. Get started with highly available printing! Download ThinPrint Engine and discover high availability for printing. The first 30 days are completely free, including all ThinPrint features.